Monica Burns is a NYC educator and EdTech Blogger. 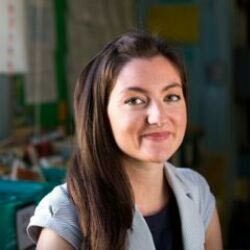 She has spent the past six years teaching in general education and Integrated Co-Teaching (ICT) classrooms at Alain L. Locke Magnet School for Environmental Stewardship, PS 208 in South Harlem. This is her second year using iPads one to one with her students. Recognized as an Apple Distinguished Educator, Monica has presented to teachers, administrators and tech-enthusiasts at numerous Apple Education events. She is a webinar host for SimpleK12, and a regular contributor to Edutopia and NJ Education Now. Her work using technology in her classroom has been featured in the Teq Teacher Spotlight and Instructional Tech Talk podcast. As a classroom teacher, Monica uses technology with her students every day. On her blog ClassTechTips.com she shares ideas on how to become a tech-savvy teacher. Monica is a graduate of the University of Delaware and Hunter College.